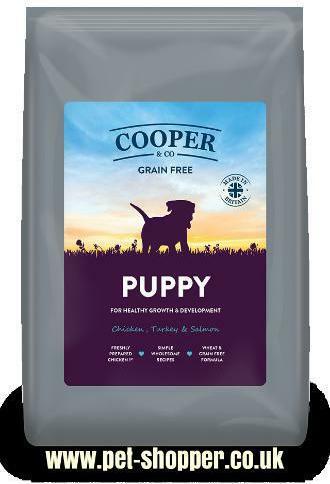 Cooper & Co have developed this grain free dog food range to provide a perfectly balanced diet for your dog. Cooper & Co feel it's really important that a dog is fed a wholesome diet containing only the finest quality ingredients. Their recipes are grain free and full of all the essential energy, nutrients, vitamins and minerals dogs need for a happy, healthy life. 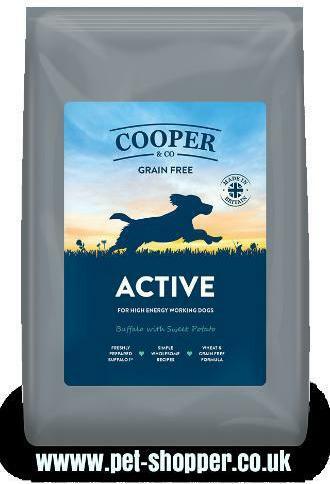 Cooper & Co believe that simple recipes are best, with fewer ingredients it's easy to understand what our four legged friend is eating and they only put in ingredients of the highest quality. Every recipe has been carefully formulated for different dogs requirements and contain at least 50% meat of which at least half has been freshly prepared. 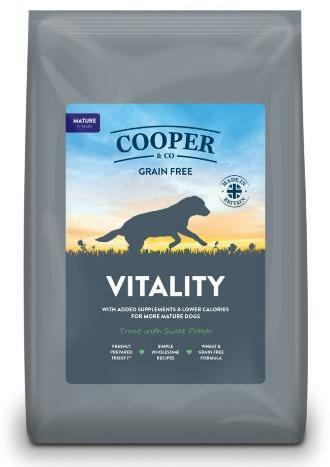 All Cooper & Co recipes are made with freshly prepared meat as the first ingredient, offer simple nutritious diets and are fantastic for dogs with food sensitivities. All formulas replace grain with sweet potato - a highly palatable altenative which has added benefits including fibre to aid healthy digestion and a slower release of energy to avoid hyperactivity in dogs. 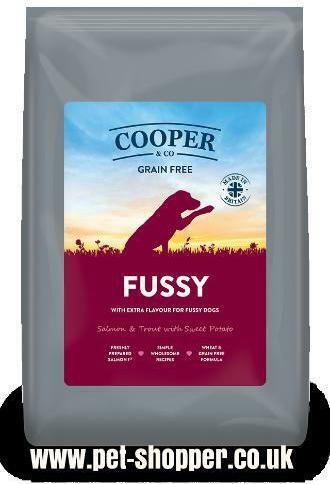 FUSSY with extra flavour for fussy dogs, Salmon & trout with sweet potato. Glossy for healthy skin and a shiny coat, Lamb with sweet potato. Sensitive with a single protien for dogs with sensitive tummies duck with sweet potato. Active for high energy working dogs, buffalo with sweet potato. Puppy for healthy growth & development, chicken, turkey & salmon with sweet potato.